The bustling city of Lisbon, the second oldest capital in Europe, and the quieter Alentejo region, still deserted, are both historically rich and enchanting. Known as the city of seven hills, Lisbon is full of museums, churches, squares and quaint cobbled streets waiting to be explored – there is something to suit all. The charismatic Alentejo is a gastronomic haven and a delight to visit. Boasting many hilltop towns, monasteries and castles – hardly touched by time; a wondrous unspoiled landscape and a relaxed pace of life, the Alentejo makes the perfect extension to a stay in Lisbon. On arrival at Lisbon airport, you will be transferred to the hotel. Opportunity to explore the capital of Portugal, where past and present stand side by side in harmony. Do not miss the cobbled streets and historic houses of the Alfama district; the traditional shopping area of Baixa and thecultural zone of Belém area. Time to enjoy more of the sites and views that Lisbon has to offer, or to do some shopping in the city that is considered amongst the loveliest, yet least known of all European capitals. 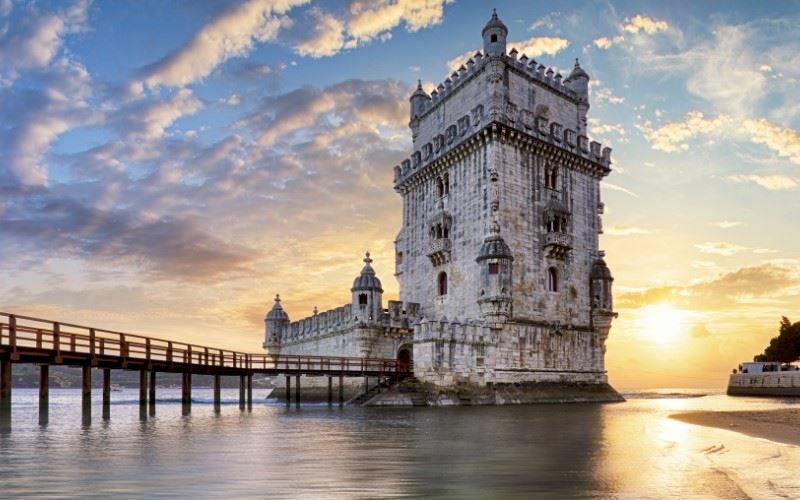 The Belém Tower, a UNESCO World Heritage site; the Santa Justa Elevator – for admirable views; the lively Rossio Square, with its two baroque fountains and neo- classical national theatre ‘Dona Maria II’, and the Avenida da Liberdade – Lisbon’s main avenue should not be missed. After breakfast, collect your hire car from Lisbon’s downtown office and drive to Albernoa (c.2-hours 30 minutes). Afternoon at leisure at the Herdade da Malhadinha Nova, your accommodation for the next two nights. Relax in the spa or beside the swimming pool, hire a bicycle or participate in a guided tour of the estate and winery – the choice is yours. In the evening a 3-course dinner (excluding drinks) is included at the estate’s Gourmet restaurant. Overnight at the Herdade Da Malhadinha Nova, Baixo Alentejo (coastal). Opportunity to explore the surrounding Alentejo countryside and the town of Beja (c.30-minutes drive) with its 13th century castle; the Church of Santa Maria – once a Visigoth temple then a mosque – and the Visigoth Basilica ofSanto Amaro. The walled town of Mertola is also worthy of a visit (c.1-hour’s drive). Perched on a hilltop, on the edge of the Guardiana National Park, the town appears almost frozen in time, with narrow streets that lead upwards to the ruins of a 13th century castle. After breakfast, drive to São Luis (c.1 hour 30 minutes) and check-in at the Naturarte Campo where you have free use of the tennis courts and mountain bikes. Overnight at the Naturarte Campo, Baixo Alentejo (coastal). Opportunity to explore the vast Alentejo coastline including the Roman ruins in Troia; tidal mills on the River Mira; the small fishing harbour of Lapa de Pombas near Almograve beach and some traditional villages. Alternatively take a stroll on the Rota Vicentina walking trail which runs close to the property. After breakfast, commence your journey to Lisbon airport for your return flight to the UK. Malhadinha Nova is a family-owned, 450 hectare country estate set in the heart of the Alentejo region. This delightful rural property is located on the outskirts of the village of São Luis within the Vicentina Coast Natural Park and between the mountains of Cercal and the River Mira. This delightful rural property is located on the outskirts of the village of São Luis within the Vicentina Coast Natural Park and between the mountains of Cercal and the River Mira. The Naturarte Campo, managed by the same family for five generations, is set within a 250 hectare estate that has always been explored for forestry and agricultural use, mostly dedicated to the wine, cork and fruit production – the latter two remaining very productive to this day. There are a number of works of art within the hotel, namely those by the owner’s relatives, J. Silva Graça and Marta de Menezes, who have been featured artists in several international exhibitions. The architecture is a marriage of both modern and traditional styles taking into account the surrounding nature. A variety of activities can be enjoyed in the area from hiking in the local hills and mountains; horse riding at the Picadeiro stables; strolling to the quaint hamlet of São Luis (800m); playing tennis or swimming in the pool.